ST. GEORGE — Details about the encounter between state and federal law enforcement and members of the armed group occupying an Oregon wildlife refuge that resulted in the death of Arizona rancher LaVoy Finicum and the arrests of others Tuesday remain murky. While accounts on social media reportedly give some detail concerning Finicum’s death, authorities have only confirmed that a man who was part of the group was killed. 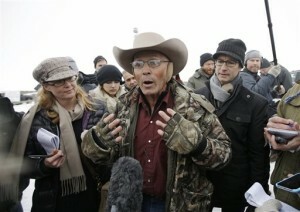 Finicum, 55, of Cane Beds, Arizona, and others, including brothers Ammon and Ryan Bundy, who have been considered the leadership of the group, were in a two-vehicle convoy heading to a meeting with area ranchers when they were stopped by the FBI and Oregon State Police on U.S. 395 around 4:40 p.m. Oregon time Tuesday. The FBI and other agencies haven’t gone into detail about what happened next, yet gunfire was involved and Finicum was killed. While the FBI has not yet released the name of the man killed during what authorities are describing as a traffic stop, Finicum’s daughter, Arianna Finicum Brown, said police confirmed to her mother that he had died, The Associated Press reported. We thank all those reaching out to us in love during this difficult time. Your faithful prayers are felt. Please keep praying and keep using your voice to get the truth out. This fight against tyranny is not over. Press forward. Forgiveness is what we can extend and understanding is what we want. Christ was and is LaVoy’s exemplar. Though there are evil and conspiring men at work, Christ still forgave the executioners for they knew not what they did. Following the incident Tuesday night, a recording of Cliven Bundy, father of Ammon and Ryan Bundy, was posted on social media recounting a call Ammon made to his wife during the traffic stop. Another account of the incident came from a video posted to Facebook by Mark McConnell, who was driving one of the vehicles in the convoy. McConnell said he saw a number of “heavy-duty trucks” while driving to a meeting in the town of John Bay, Oregon. Those trucks ended up being the FBI and Oregon State Police who pulled the convoy over. After McConnell’s vehicle was secured, agents went to check the truck reportedly driven by Finicum. Someone got out of the passenger side of the truck who then went to the ground and was handcuffed. McConnell said he couldn’t tell who though, as Finicum’s truck was about 200 yards ahead of him. “Next thing we know, LaVoy takes off (in the truck),” he said. McConnell said he did not see what happened next but heard from others who were in Finicum’s vehicle that they encountered a roadblock. “… Once they got down there by the road block, I don’t know if he tried to go around the roadblock or what he did, but the nose of his truck got stuck in a snowbank, right there,” he said. As he understands it, taking “pieces here and pieces there” from what he’s been told by those who were with Finicum and what he had seen himself, McConnell said, he believes that Finicum got out of his truck and charged at law enforcement. “… He went after them. He charged them,” McConnell said. Relatives of Ammon Bundy offered similar accounts, but they said Finicum did nothing to provoke FBI agents, the Associated Press reported. Briana Bundy, a sister of Ammon Bundy, said he called his wife after his arrest. He said the group was stopped by state and federal officers. 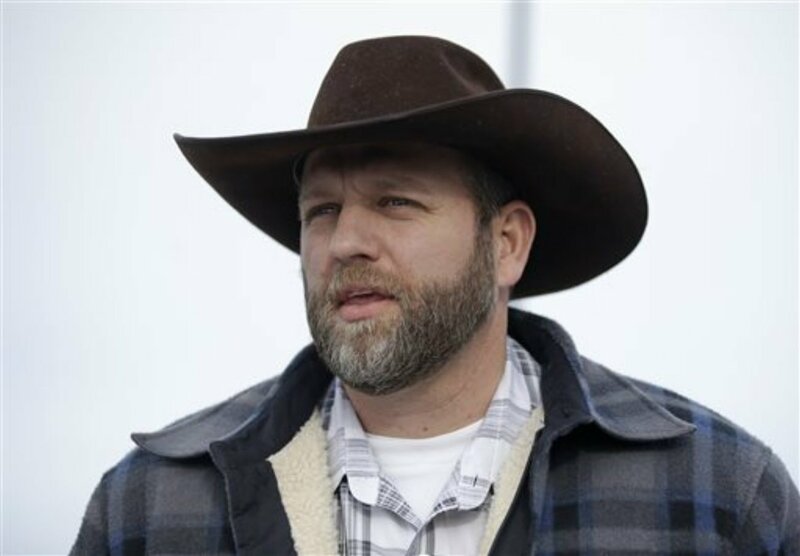 Her recount of what Ammon Bundy told his wife largely reflects parts of what Cliven Bundy said in the recording posted to social media Tuesday night and also added additional details from that perspective. She said people in the two vehicles complied with instructions to get out with their hands up. “Ammon said, ‘They murdered him in cold blood. We did everything they asked, and they murdered him. We complied with their demands,'” Briana Bundy said. McConnell had a different perspective. “Anytime someone takes off with a vehicle away from law enforcement after they’ve exercised a stop, it’s typically considered an act of aggression, and foolish,” he said in a video posted on Facebook and YouTube. McConnell said he was questioned by authorities and he believes he was not charged because he was not considered a leader of the group. Briana Bundy confirmed that McConnell was in the convoy on Tuesday, the Associated Press reported. In the press conference Wednesday, Bretzing said the armed protesters have had ample time and opportunity to leave. What happened Tuesday was a consequence of the group’s actions, he said. Bretzing, along with Harney County Sheriff Dave Ward and others are asking those who remain at the wildlife refuge to leave. 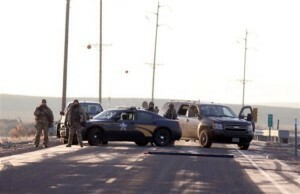 Those who do will be met and identified by law enforcement who have established checkpoints around the refuge. Ward said the occupation of the wildlife refuge, which has been ongoing since Jan. 2, has been tearing the community apart and again asked the protesters to leave. He also told them to take their grievances with the government through legitimate means and not through armed rebellion. Along with Ammon and Ryan Bundy, others who were arrested include Brian Cavalier, 44, of Bunkerville, Nevada; Shawna Cox, 59, of Kanab, Utah; and Ryan Payne, 32, or Anaconda, Montana, during what authorities characterize as a traffic stop on U.S. Highway 395 Tuesday afternoon. 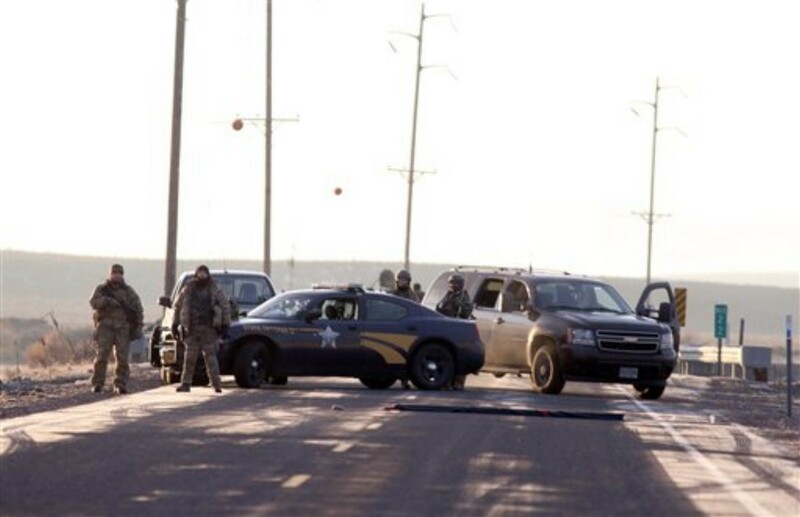 Authorities also arrested Joseph Donald O’Shaughnessy, 45, of Cottonwood, Arizona, who was arrested in Burns, and Peter Santilli, 50, of Cincinnati, Ohio, and Jon Ritzheimer, 32, of Peoria, Arizona. According to an FBI press release, those arrested are facing a federal felony charge of impeding officers of the United States from discharging their official duties through the use of force, intimidation or threats. Why do we need an “investigation” Bretzing? Simply release the unadulterated video showing Mr. Finicum’s murder. 1) The road block was in place, the FBI killed Finicum all before any arrest warrant was signed by Honorable Stacie Beckerman. 2) Page 32 of Complaint, item 56 states who was taken into custody. 3) Item 57 “Conclusion” respectfully requests arrest warrants based on the Complaint dated 1/26/2016 AFTER THE AMBUSH TOOK PLACE. 5) Through OECI, filers can e-file 24hrs a day from any location. Mandatory for attorneys such as special agent Armstrong. 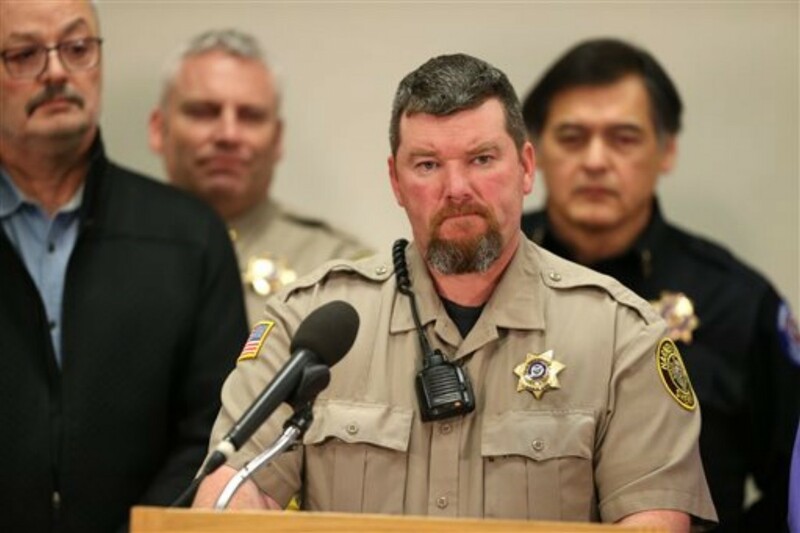 It wasn’t an ambush, it was a road block which Finicum tried to run. You don’t need an arrest warrant to shoot somebody. The mess is over, Finicum got what he was looking for, give the cop that shot him a short paid vacation to get over the stress and let’s move on. Oh, what about the 9mm in his pocket. Was it legal for him to conceal carry in Oregon assuming he had an Arizona permit. No, looks like Finicum got exactly what you get when you play with guns and fail to stop at road blocks. LEO don’t hide in trees in what would be considered a legit road block. These are not violent known criminals, nor has the FBI ever labeled them armed and dangerous. The felony charge is not a “violent” charge. In fact the entire Complaint is based off videos, social media from the occupiers themselves. Clearly the special agent Ms. Armstrong felt there was a legal need to add item 57 to the Complaint as all were already in custody. In this long drawn out case, don’t think much of your usual will apply. The government murdered LaVoy Finicum because he was of unimpeachable character and was a very real threat to their propagation of the “crazy militants” lie. So they ambushed the group and killed him — only him. Mr. Finicum involved himself because he believed completely in the righteousness of the cause. Because of his exemplary character and conviction, he was able to draw strong support and attention (in contrast to the circus atmosphere created by the Bundys) to the criminality involved in the Hammonds’ trials and subsequent imprisonments by this government. By all accounts Mr. Finicum was a man of courage, self-sacrifice, resolve, valor, perseverance, and bravery — he was a threat — he jeopardized the government and the media’s fictional version of events surrounding the Hammonds. Release the unadulterated video so we can all see exactly what happened during the government’s ambush of these people. No one wants or needs a corrupt entity’s written report of the events leading to Mr. Finicum’s murder. If they release the video then the truth will be seen and the government has a hard time with truths being revealed. They find it much easier for cover ups to be done…and late night shredding parties! The most accurate witness statement would be the young girl’s. The moles, as most in the inner circle are calling the other fb accounts, blasting themselves on social media looking like secret agents, are assumed FBI informants. If they were (I believe so) they are now standing without cover. You have not seen this video, but you are already convinced that Finicum was murdered with absolutely no evidence to back up your opinion. It’s hilarious that refer to yourself as “accountable.” Clueless would be a much better screen name. Thanks for the great video Bender. I doubt Accountable will be able to muster up the gumption to admit that he was wrong YET AGAIN! The most he will probably do is accuse the government of staging it or something and will cite some kook right wing extremist website as his “source” like he normally does. OK, the video is released. Finicum does indeed raise his hands initially, but then lowers them and goes for his waist where he was carrying a firearm. Shooting was completely justified from the video. Finicum was either going for his gun, or he was one really stupid hillbilly. Probably, both. Hey Accountable If you hate our government so much why don’t you LEAVE and find some place where the majority of people share your views? For example, I’m sure you’d be welcome at any ISIS compound. Finicky achieved his goal of martyrdom. Now he is in paradise with a bunch of ugly virgins. There is only one person responsible for the death of Robert LaVoy Finicum and that is Robert LaVoy Finicum. His choices and his actions lead to his death. RIP Robert, but know that you made a selfish choice and you deprived your family of your own life. No one else did. Condolences to all those affected by this. I would still put my belief that armed revolt isn’t the way to go. Win the hearts and minds of people and then use strategic peaceful protest (including being arrested) to draw attention to the cause. The entire system could be completely overwhelmed for a just cause. Actions of the GOVERNMENT agents ‘are not without consequences’! Now let’s focus on the facts behind the government’s land grab and the criminals who are driving these actions. Educate yourselves and demand accountability. You are now entering ACCOUNTABLE’s twilight zone. Rumor, fact, fantasy and delusion will blend into a glorious nonsensical haze. Check your critical thinking at the door, power up your paranoia pistols and get ready to pound reason into the ground. Drill baby, drill. Yee Haw!!! We gonna rock this thing!! This is all of public record. Sorry, I listened again and all I heard was incoherent ranting and raving. Could you repeat it? Better quit digging, accountable. You’ve made quite a paranoid fool of yourself. He got what he deserved. the feds should of gone in guns blazing the first day and taken them all out ! So Very Sad, your dispicible Comments About A Man That Just Stood Up. He is Now Gone And You All Rant? Yes Sad Indeed. Terry, you’re channeling Donald Trump here. “Sad” punctuates his Twitter attacks.